Nature can be easily found in the city, and not just plant life. On any given day in town, we will can see animals such as squirrels, possum, earthworms, insects, horses, fish, birds, as well as dogs and cats. We even had a problem with raccoons for a while here. Unfortunately there are also rats, which at night can sometimes be seen scurrying from storm drain to sewer drain. Growing up, I remember seeing dead animals many times. For example, I remember seeing a frozen cat disappear into the dirt as spring started. It is part of learning about the cycles of life. I also remember seeing maggots for the first time in my life on a dead mole. 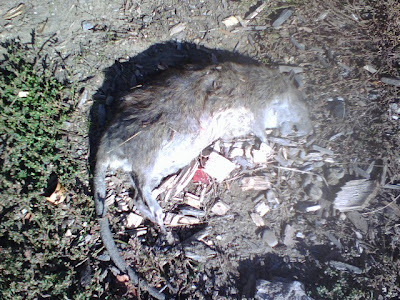 Below is a photo of a dead rat, found at the edge of the Findlay Market Playground. My son looked for a few seconds, then shrugged his shoulders and ran back to play. The fact that today is election day is pure coincidence. Mike, I regret to advance this conspiracy theory, but there is something about the absence of a coincidence between dead rats and election day that is nagging me. How bizarre.